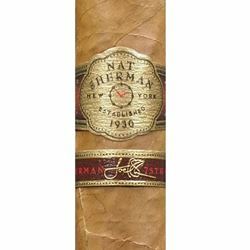 The Joel Sherman 75th Celebration Cigars are the embodiment of a lifelong desire to create unique smoking pleasure for my friends and customers. I have always been asked, ""How do you smoke a cigar?"" and my answer is always the same, ""However you like."" - Joel Sherman. Only 2,500 boxes in production, this cigar features a unique 7.5"" x 46 vitola with aged filler tobaccos and a binder from the Dominican Republic. The cigar is finished with a stunning hand selected Ecuador wrapper leaf.